The biggest pumpkin in the world this year weighed 1,818.5 lbs. and came from Wellington, Ontario. But its story actually began in 1986 in Windsor, N.S. 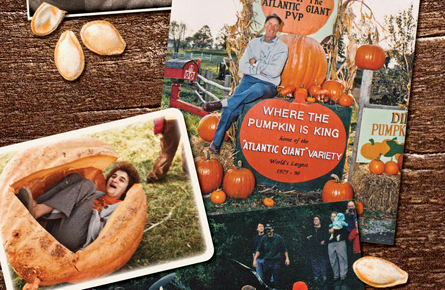 Twenty-ﬁve years ago, a Windsor man named Howard Dill patented a pumpkin seed variety he named the Atlantic Giant. Dill was a full-time farmer and part-time mad scientist. Home from the evening’s chores, he’d work for hours at the kitchen table, doodling pumpkins and taking notes on his experiments. He spent years secretly perfecting a new line of super heavyweight pumpkins. What started as a friendly rivalry with other local farmers at the Hants County Exhibition’s annual pumpkin weigh-off became a full-on obsession by 1980. Before the decade was out, Dill set two records for the world’s heaviest pumpkin. But it wasn’t his pumpkins that made Howard Dill the most famous man in the giant pumpkin world. It was the seeds inside them that, combined with his own genetic crossbreeding technique, sprouted the modern quest for the biggest pumpkin of all time. Today, 20 generations of competitive pumpkins can trace their roots back to the first Atlantic Giants. This fall, more than 10,000 hobbyists in 14 countries entered giant pumpkin contests using seeds derived from Dill’s. “He is the father of the modern pumpkin weigh-off. There’s not one growing now that doesn’t go back to him,” says Dave Stelts, president of the Great Pumpkin Commonwealth, a nonprofit that sanctions over 80 pumpkin weigh-offs around the world. Dill died in 2008, but he lived to witness the world’s first 1,600-lb. pumpkin. Now growers are closing in on the 2,000-lb. mark. “He just couldn’t imagine a 1,600-lb. pumpkin. It was beyond him,” says Howard’s son Danny Dill, who runs the Dill Farm with his sister, Diana MacDonald. Today, the farm draws 5,000 tourists a year and sells 2000 lb. of seeds—enough to grow 2.4 million pumpkin plants. Atlantic Giants are tipping the scales in Australia and Finland. The prospect of a one-tonne pumpkin would have dumbfounded Howard Dill. A quiet and serious man with a seventh-grade education, Dill taught himself about plant genetics by reading gardening magazines. It occurred to him that he could isolate a male and female flower and perform his own pollination ritual to combine the most desirable characteristics of two plants—one with a nice orange colour and one heavy enough to break the back of his hay wagon. When he swept the weigh-offs for three years straight, he knew he had his own genetic imprint. His real source of inspiration was the farm itself. “He was so particular about what kind of bull he would allow to breed with his cattle. He liked a quiet bull, not a bad bull. He just took it from that to the pumpkins,” says Danny Dill. Championship pumpkin growers aren’t entering beauty contests. Their ideal pumpkins look more like mutant lumpen marshmallows, their skin a mass of hardened yellow-green scar tissue. The inner walls can be 30 cm thick, decidedly unfit for pumpkin pie—but perfect for a weigh-off. Today, the Dill seed brand is better known for its pleasing orange hue than its girth. It’s a beginner’s seed, guaranteed to produce a supreme jack-o’-lantern. Like a parent who looks up one day and realizes his children have grown to be taller than him, Dill watched younger growers push their gourds into a different stratosphere using products and techniques he’d never dreamed of. These growers have invented a few methods of their own, like garnishing plant compost with exotic amendments such as kelp extract and mycorrhizal fungi. No sacrifice is too great for the pumpkin elite, who spend thousands of hours pruning, heating, cooling and sheltering their pampered gourds. They spray the leaves with misted carbon dioxide, and treat them for root rot, fearful of disease. They mail leaf samples to far-off laboratories for analysis, and use the results to decide which additives—including calcium and phosphorous—to apply. Then they stand back and watch as their titanic fruits gain up to around 50 lb. a day. As each generation of gourds surpasses the last, it produces seeds that form the basis for the following year’s mutant orbs. The seeds with the grandest lineage are much in demand within seed-trading circles and at online auctions. 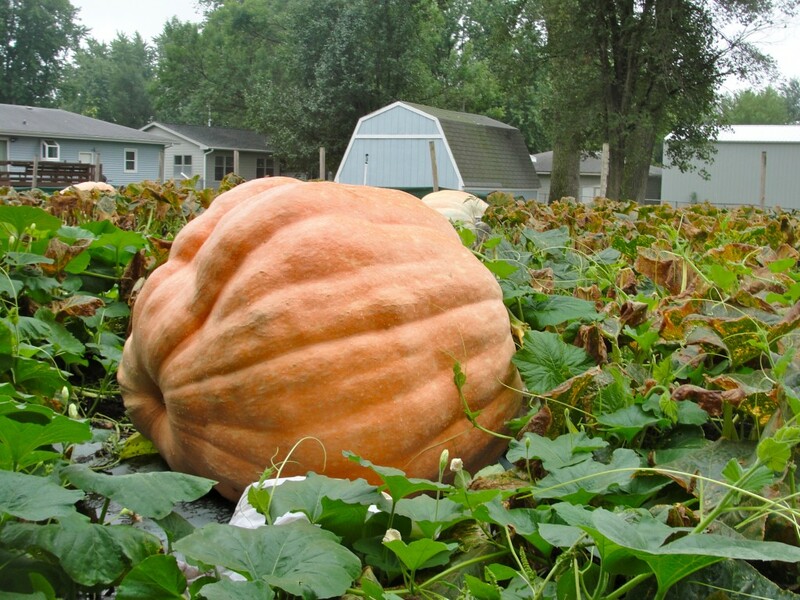 Someone paid US$1,600 for a seed from the 2010 world championship pumpkin, which weighed 1,810 lb. and was grown by a contractor named Chris Stevens in New Richmond, Wis. Clad in blue jeans and a checked shirt, Dill transcended the role of small-town farmer and became the worldwide ambassador for his Atlantic Giants. He and his homegrown gourds appeared on The Martha Stewart Show, but he also gave his time to every visitor to his farm who wanted to talk pumpkins (or hockey, his other passion). When someone set a new world record, Dill sent a personal letter congratulating him or her on the achievement. He wrote those letters well into his seventies, right up until he died. Windsor has a carved wooden statue of Dill, smiling beneath his baseball cap. But few Canadians are aware of the legacy of the man who passed on his obsessive quest for the perfect seed. Fewer still have seen the family farm, which grows 30 pumpkin varieties and houses cattle in the same old barn, built in 1840, that Dill’s own father grew up working in. Windsor triples in size over Thanksgiving weekend for the annual Pumpkin Regatta, as 10,000 spectators drive up to watch a few dozen locals row (awkwardly) across Lake Pesaquid in brightly painted, hollowed-out giant pumpkins. (There’s also a motorized competition.) “A couple of women approached Danny and said, ‘What can we do with these pumpkins other than grow them?’ and Danny said, ‘Let’s have a race with them,’ ” recalls Diana MacDonald. The regatta is now in its 13th year. HOST: Each fall, hundreds of thousands of birds descend the California coast on their journey south. One species spend their nights in chimneys, creating a spectacle that draws onlookers from around the state. Reporter Julia Scott visited a popular roosting site in the Sonoma County town of Healdsburg last week and brought back this postcard. JULIA SCOTT: A few minutes before sunset, a small crowd gathers on a lawn at Rio Lindo Adventist Academy in Healdsburg. They’ve got picnic blankets and lawn chairs, cameras and binoculars. They’re sitting around, staring at an office building with an old chimney, and waiting for something. Something magical. BERNADETTE CHADWICK: Bernadette Chadwick, I live in Los Gatos, California. I was anticipating a chimney that was a really old thing, like 100 or 200 years old and then I found this building. Very surprising that it’s so modern. Chadwick and her family drove more than two hours for this chimney – or more precisely, the birds that are starting to converge around it. The Vaux’s swifts, one of four species of swift, are coming home for the night. They roost in chimneys. And for a few weeks in September, as they pass through California on their southward migration, birders come to watch the swifts pour themselves down into chimneys – sometimes 20,000 at a time. CHADWICK: It’s very exciting to anticipate the moment when they’re going to go into a huge mass and decide to go down into the chimney and give us all a treat. And now, it’s showtime. 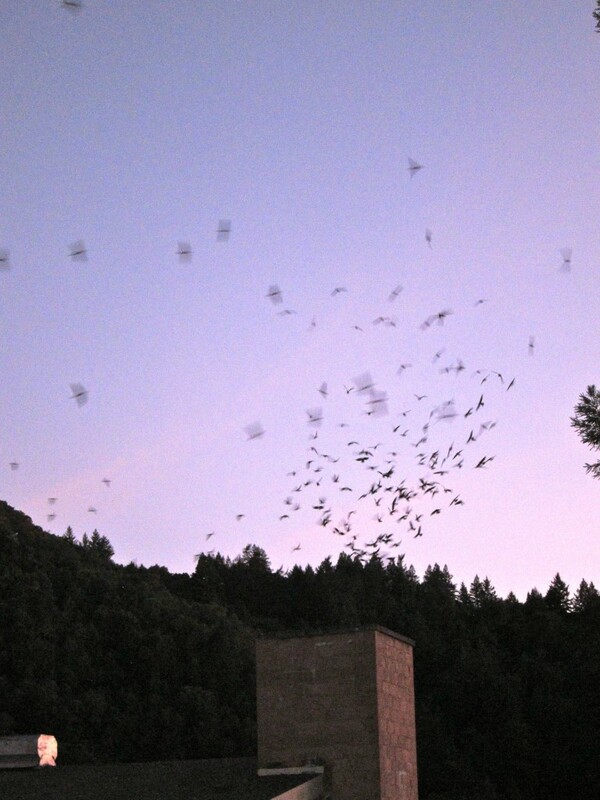 After a meal of spiders and mosquitoes, the swifts mass into a living tornado… hundreds of birds turning together in a circle, spinning clockwise, moving closer and closer to the top of the chimney. The sun is setting, and the swifts look like bats in the sky. CHADWICK: Oh, it’s mind-boggling. It’s fabulous, I can’t even describe it. I love their chirps, don’t you? It’s like the stars in the sky the way it’s circulating around. It’s just gorgeous. Suddenly, a peregrine falcon swoops into the column… Then, a few moments later, a cooper’s hawk dives in for the kill. This time, it catches a swift in midair. Brad Benson counted 1,200 swifts tonight, relatively low for this time of year. He’s an administrator at this school and he’s part of a network of birders who track the swifts on their annual fall migration. BRAD BENSON: This is the Pacific coast migratory flyway for birds coming out of Alaska and south. They just somehow discovered this chimney in 1989 when we stopped using the building for heating the water year-round on campus. Chimneys weren’t always an attraction. For centuries, the swifts nested in the hollow trunks of redwood trees, but 95 percent of those trees have been cut down. That led the U.S. Fish and Wildlife Service to declare the Vaux’s swift a California Species of Special Concern. Chimneys and smokestacks became the best alternative, since they’re big enough for the birds to fly inside. LARRY SCHWITTERS: They don’t perch, they hang, and they’re able to hang on the mortar between the bricks and line up like shingles. Larry Schwitters, a retired science teacher in Washington State, was the first to sound the alarm over the fact that those old-fashioned industrial brick chimneys are now themselves endangered. SCHWITTERS: It’s reaching the point where there’s fewer and fewer chimneys, and the birds are getting concentrated more and more and more, and eventually we’re going to run out. Schwitters has travelled across the Northwest, cataloguing popular roosting sites, and he’s created a website to track the swifts on their migration. He and a network of volunteers with the Audubon Society plan to use the data to preserve the most important chimneys. Birders can catch the Vaux’s swift as they descend upon Los Angeles next week at one of their favorite roosts, the downtown Chester Williams Building. For the California Report, I’m Julia Scott.